BEINGS from BEYOND: Angels, Devils, And Demons Reimagined for Fifth Edition by Ben Evans is a new 5th edition supplement that has already reached its Kickstarter goal! I received an early copy of it before my vacation last week and spent quite a bit of time perusing its contents. As I’ve mentioned before, I’ve been gearing up to run a Shadow of the Demon Lord campaign, so I’ve already been immersing myself in demons and demonic lore. BEINGS from BEYOND couldn’t have arrived at a better time for me. I also have to say that I love the aesthetic of the book. It has a very “old school” feel about it, full of black and white sketches that work really well with this style of supplement. The font choice also adds to this old school RPG book aesthetic, but it’s still perfectly easy to read. According to the Kickstarter, it’s slated for release in June/July of 2019 in PDF, softcover, and hardcover format via DriveThruRPG. In its final version, the book is planned to be over 135 pages long not including all of the extra stretch goal content. So let’s jump right in and take a look at the upcoming supplement for angels, devils, and demons: Beings from Beyond! As I said, I’m a big fan of the art in this book. Credit: BEINGS from BEYOND. The review copy that I received isn’t the finalized version of the product. The vast majority of the contents of Beings from Beyond were included in the review copy. However, the formatting wasn’t entirely completed. Also, a couple of the tables and the additional stretch goal rewards were not included. What is BEINGS from BEYOND? When I initially looked at the Kickstarter page, I was expecting this to be a big bestiary full of demons, angels, etc. Needless to say, I was surprised when it wasn’t. Or, rather, there aren’t a lot of premade creature statblocks. The book focuses entirely on those three types of creatures, but not solely on the creatures themselves. Instead, it focuses on how each of these three types of creatures operates. For example, what is Hell like and how do devils operate? It gives you the building blocks to create not only awesome angels, demons, and devils, but the tools to create a campaign that revolves around any or all of these creatures. There’s a fair amount of lore to read through in the book for each of these types of creatures. I think it’s great information in its own right, but it’s by no means the focus of the supplement. Tables, Tables, and More Tables! The vast majority of the content in BEINGS from BEYOND revolves around rolling on tables to determine a specific outcome. However, the variety of different things these tables create is staggering. There are tables for plot hooks, fortresses, creatures, afflictions, weaknesses, behaviors, and quite frankly, anything else that you could think of needing to play a D&D campaign that revolves around angels, demons, or devils. You can make an army of devils alongside a leader, a hellish spire, and a reason for their invasion of the world with a few quick dice rolls. This means that you can focus the rest of your prep time on other parts of your campaign such as worldbuilding or creating NPCs. The same can be said for demons and angels. I found a newfound respect for devils after reading through this. Credit: BEINGS from BEYOND. The interesting thing about BEINGS from BEYOND is that there are tons of different creatures that you can create. That’s right, the creatures in the book are essentially made by you, the reader. To create a creature, you’ll walk through a set of tables and generators to create a unique creature, or you can simply roll the dice and see what you make. For example, to create a demon, you can start with 3 different basic demon statblocks: Hungering (CR 5), Ravening (CR 10), and Devouring (CR 15). Each of these statblocks has some base values such as their ability scores, skills, resistances, and basic attacks. However, you’ll roll for their Profane Abilities to give them flavor and new mechanics. 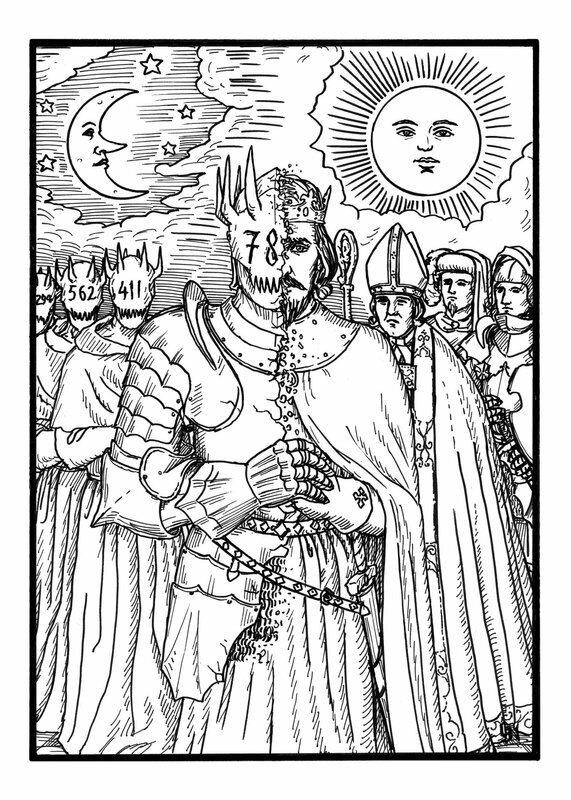 Profane Abilities are a demon’s special attributes or Actions. Each of the different creatures in the book has some sort of randomized attribute or ability to change their playstyle and give them a unique ability, though they’re not all called Profane Abilities. I did find that some of the descriptions for these abilities are a bit lengthy. However, they don’t feel like they have a ton of unnecessary fluff within them. This could be due to the fact that the version I received wasn’t fully formatted. 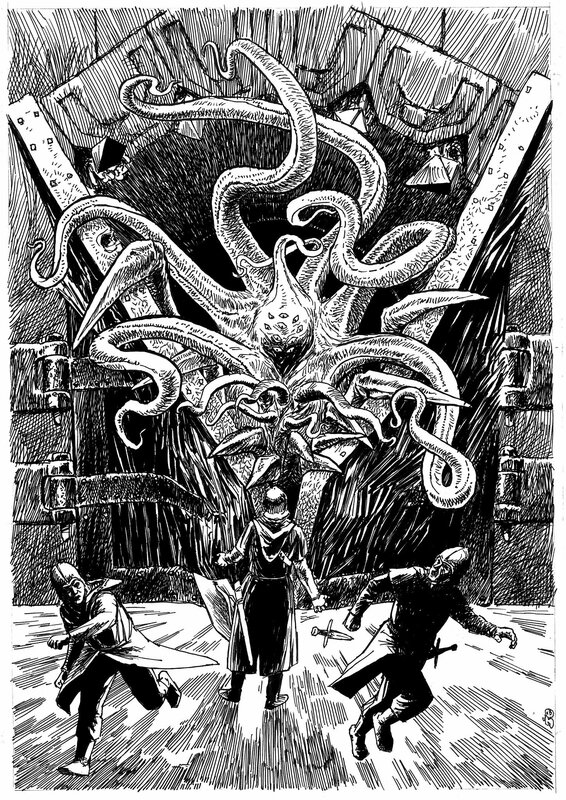 There’s no denying that BEINGS from BEYOND was made for D&D 5e. Whenever mechanics are mentioned in the book they always refer to D&D 5e specifically. That being said, specific mechanics are typically only listed when generating a creature or something that the player characters interact with on a mechanical level. Which, while this is a significant chunk of the book, is by no means the only part of it. Any table that is used for worldbuilding or role-playing is generally entirely system agnostic. If you want to generate a hellish spire you can generate a hellish spire then cater it to whatever game system you desire. The creature generators, though full of D&D 5e specific mechanics, have a ton of descriptions on the creature’s biology, behavior, etc. that I could see being valuable to someone using the generator for a different game system. They’re a great way to generate ideas and descriptions. It’s like a roper, but somehow much worse! Credit: BEINGS from BEYOND. In addition to the chapters on angels, demons, and devils, there are also 5 appendices that add some additional related content. A couple of these are more role-playing centric which are nice for coming up with things like the name of a ritual on the fly. My favorite section, though, is the one that adds two new tables full of options for Demonic Madness which is a new type of affliction similar to that of the Madness condition in D&D 5e. These are specific to demons, but I’m sure you can utilize these for other types of creatures and encounters in your games. There is also an appendix that contains 3 new spells. One of these is a 1st level spell, and the other two are cantrips for a wizard, sorcerer, or cleric. I’m actually not a huge fan of these as a whole. Outside of the Opening of the Third Eye cantrip that lets you see a random obscure factoid, the spells seem a bit overtuned. However, there will be an expansion on the spells appendix if the Kickstarter hits the £3000 tier (currently ~£300 away). I’m expecting that this section will be worked over a bit more after that. Regardless, it’s only roughly 2 pages in the appendix of the 135+ pages of content. 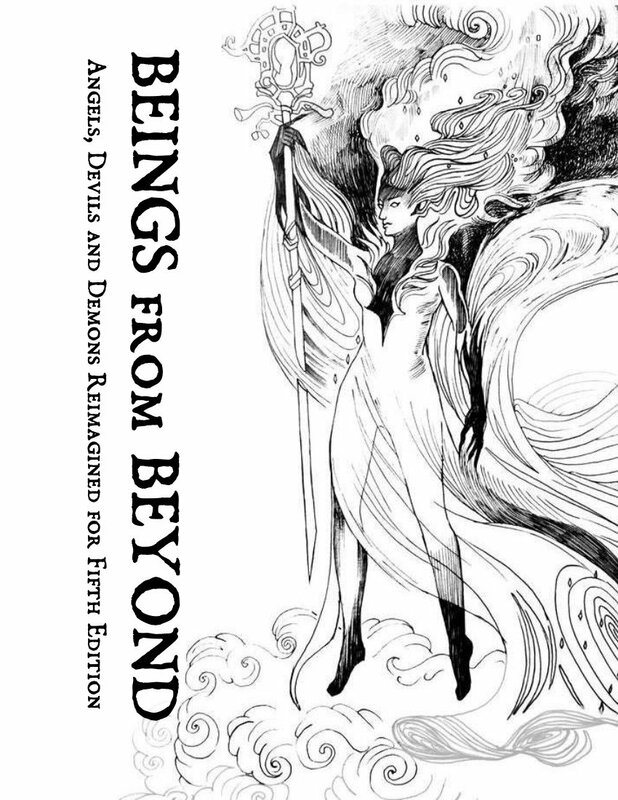 BEINGS from BEYOND is a fun D&D 5e supplement for a Dungeon Master that’s looking to dive deep into angels, demons, devils, or all of the above. I can see myself getting a ton of mileage out of the tables within the book whenever my campaigns start trending in one of those directions. The lowest backer-tier to receive a copy of the book is ~$13 which I feel is a fair price point considering the quality of the supplement’s contents and the artwork. It’s around 135 pages long, so you’re getting a lot of bang for your buck. While the book is clearly geared towards 5th edition D&D in terms of its creature mechanics, I’ve found it to be easily convertible to other systems. The plot hooks, lore, and role-playing tables and sections require no tweaking on the GM’s part to make stuff work outside of D&D. I think BEINGS from BEYOND is well-worth the price of admission. It has an awesome aesthetic and a ton of quality content to keep coming back to thanks to all of the tables and generators in the book.